Claim up to €/$/£1,250 welcoming bonus Play Now! Microgaming casino sites were able to capitalise on the surging appeal of zombie fiction with the October 2016 release of the Lost Vegas slot. Zombies have been appearing frequently in movies and TV shows for years now, with the Walking Dead being the best-known example. In Lost Vegas, Microgaming casinos can provide players with a slot game that sees the undead plaguing Sin City. This is a unique take for a slot that has been designed with grisly visuals that are worthy of appearing on the pages of a graphic novel. 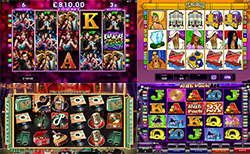 From the outset, Lost Vegas has been capable of performing on desktop and mobile screens alike, with all platforms able to run the five-reel slot. Meanwhile, instead of including paylines, Microgaming has chosen to integrate 243 ways of winning within Lost Vegas. The wagering system has been simplified to allow for players to stake a single total value and still have all chances of winning open to them. In terms of the options, Lost Vegas can allows for wagers that range from €0.30 up to €45.00 per spin. The return to player percentage is quite high at 95.77%, while the variance is also really high. This is evident from the fact that matching five of the following symbols can trigger major multipliers: man (1,875x); Elvis zombie (1,875x); Raoul Duke (1,500x); woman (1,500x). • Wild symbols: these have the ability to substitute for most symbols except scatters. • Free spins: assign either Survivor or Zombie mode and land three-plus hazard scatters to commence free spins. • Survivor free spins: ace symbols are removed and add cash to your stash. • Zombie free spins: wild symbols are turned into stacked ones. Stacked wilds can spread and infect up to five reels for a maximum of 50 free spins. • Blackout Bonus: randomly activated after a non-win, causing high-value symbols to provide cash prizes and single scatters to trigger free spins. • Zombie First of Cash: non-winning spins can deliver random cash prizes. The graphic novel style of Lost Vegas looks super-cool, but the slot has much more going on beneath the sleek surface. The high variance means that there are some meaty payouts to gain from the symbols, while Lost Vegas also excels for the two types of free spins and two random special features.